View More In Space Heaters & Accessories. 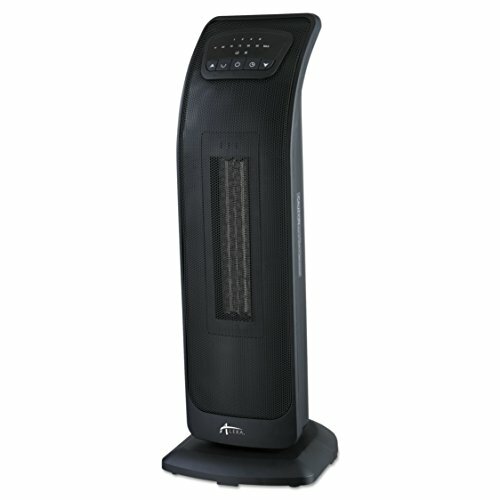 Ceramic Tower 1500 Watts Electric Oscillating Black Heater is perfect to heat up your room. Air is warmed as it passes over a large ceramic and aluminum heating element. Heat is dispersed by a powerful fan. Programmable digital thermostat can be set to your ideal temperature. Up to 1500 watt heating output for maximum comfort. Auto-off timer up to 15 hours. Designed with safety in mind with overheat auto-shut off protection, tip-over switch, and a cool-to-the-touch plastic housing. Includes remote control. Programmable digital thermostat can be set to your ideal temperature. Up to 1500 watt heating output for maximum comfort. Auto-off timer up to 15 hours. Designed with safety in mind with overheat auto-shut off protection, tip-over switch, and a cool-to-the-touch plastic housing. Includes remote control. If you have any questions about this product by Alera Heater, contact us by completing and submitting the form below. If you are looking for a specif part number, please include it with your message. 1500W Indoor/Outdoor Infrared Heater - Electrical Outdoor Heater Panel 1500 Watts - NO GLOW, JUST LUXURIOUS HEAT!